Let's face it. Information technology is becoming a more important part of our daily lives. ​The lines between personal and work technology are blurring, and the systems we use to operate our company are becoming more sophisticated. Advancement of IT infrastructure and application software is accelerating at a dizzying pace, and keeping up with this environment requires us to rethink our approach to IT processes - our software portfolio, technology deployment, data management, security and risk management, service management, etc. 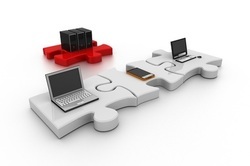 Service models, such as flexibility and responsiveness, are the new IT objectives.